When you are looking for ways to use your industrial spaces as efficiently as possible, it is often a good option to save space in drying installations. Furthermore, it is important to dry the seeds in every box well using sufficient air. And it is probable you would want to keep using the existing drying boxes. The boxes can be placed 3-4-5 stacked on top of each other in a drying installation. 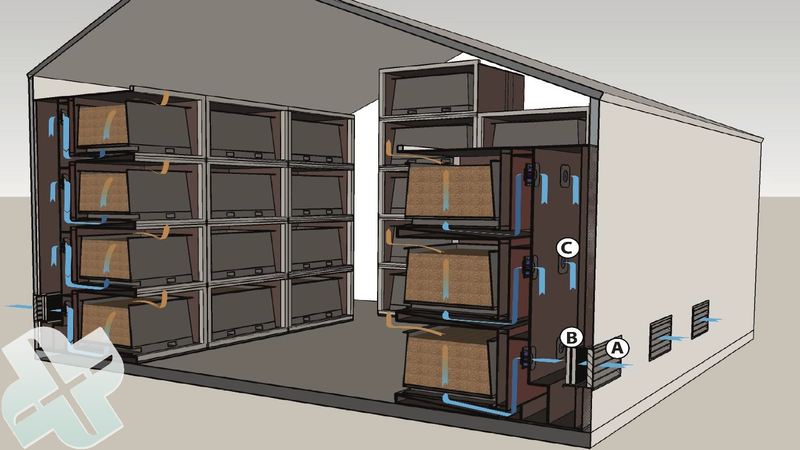 Below every box there would be a plenum, which blows air through the box with the help of 1 or 2 small high-pressure fans. This ensures sufficient air is blown through every box. 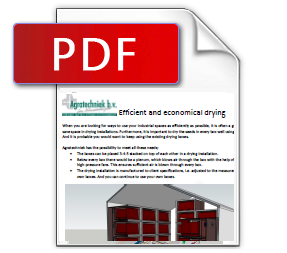 The drying installation is manufactured to client specifications, i.e. adjusted to the measurements of your own boxes. And you can continue to use your own boxes. In an existing or new hall, the height can be maximized with the individual drying installation. The height of the box quantity can be adjusted per row. In a building with a surface of ca. 10x10 m and 6 m high, this option would make it possible to dry 40 boxes individually. The boxes are placed on top of each other in stacks of 5, and there is enough space for a forklift; 80% better use of your industrial space. With another set-up and a sidewall of 5 meters high, it is possible to dry at least 160 boxes at the same time, in a space of ca. 30 x 13.50 meters. At the sidewall, the dry air is suctioned from the rear side. When there is a central set-up, the air is suctioned through a central shaft from the headwall. Every box is equipped with 2 high-pressure radial fans. Thanks to the great efficiency of these fans, 30 boxes can be dryed at the same time with 10 kW power. The air quantity would then be 60,000 m³/h at 300 Pa. The air flows more difficult through a full box than through a half-full box. The same can be said for a humid box and a box with fine seeds. This can have large consequences for a standard drying installation with 1 fan. Almost no air will flow through a full box with moist and fine seeds, when it is lined up with boxes full of dryer and/or coarser seeds. And this is especially the case when there are half-full boxes in between those boxes. The installation will be customized to your desires. We take into account the size of your boxes and the available height, the routing within your company and possible expansion in the future. 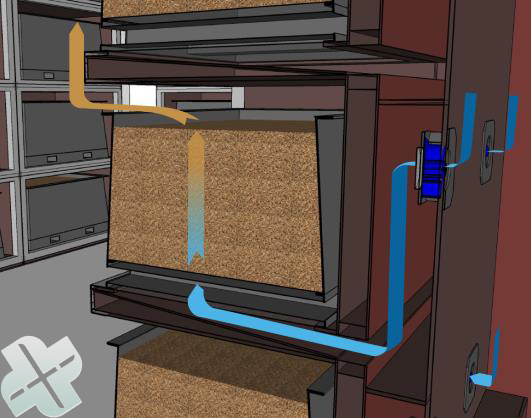 When the drying process takes place with `double boxes’ (dryer and humid), the installation will be adjusted as needed. 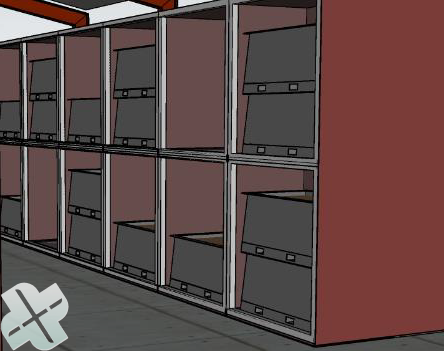 Boxes will be restacked more efficiently as the top drying box can be placed directly into the empty place below or above.